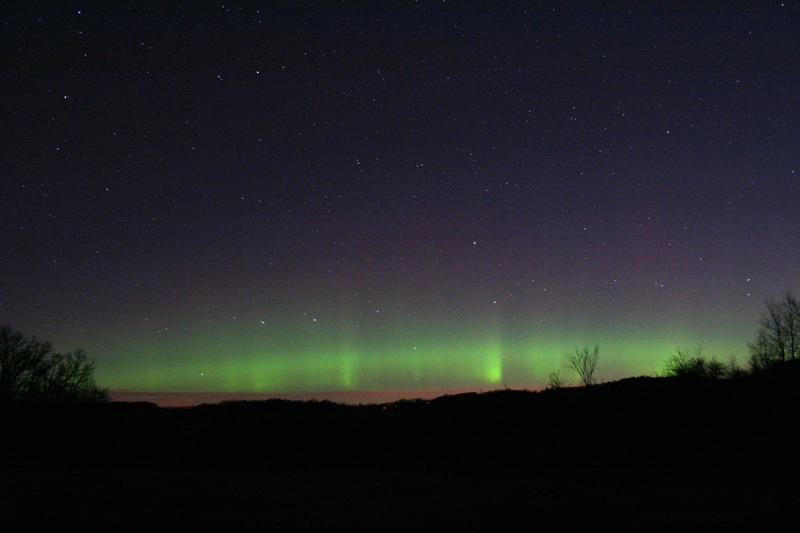 The dark skies of Mineral Point are a great place to experience the northern lights. Northern lights, also called aurora borealis, originate from sunspots. A solar flare will violently eject ionized particles from the surface of the sun and some of this material is channeled down to Earth’s poles by the Earth’s magnetic field. The sun goes through cycles of solar activity which peaks about every 11 years and we are nearing one such peak this year. Although most displays of auroras are limited to the extreme northern and southern latitudes, strong auroras can be seen from southern Wisconsin. A particularly energetic sunspot, AR1748 is currently rotating into position to be ‘aiming’ directly at the Earth. If this sunspot has a flare, there’s a good chance we’ll see northern lights a day or two after the flare occurs. Northern lights displays are difficult to predict, but the Iowa County Astronomers have a couple of tools we use to let us know when they are happening. The Iowa County Aurora Alert system is a computer system I developed that can call your home or mobile phone with an automated message whenever one of our club members have confirmed visible aurora in our area. If you live in southwest Wisconsin and would like to be added to this system, email me at johnw@allprosoftware.com and provide your phone number and hours you don’t want to be disturbed, or if it’s ok to call at any hour. For example, no calls after 11pm and before 7am. The phone alert system works well, but it has a limitation- one of our administrators must have seen an aurora and activated the alert process. If aurora occur in the middle of the night (as happened recently) it may not get activated. I have developed another application called Astrogadgets which provides several tools for amateur astronomers including a monitor of the planetary KP index which is an indicator of aurora activity. Astrogadgets can be configured to send you a text message when conditions are favorable for aurora. This is a Windows program (sorry no Mac version) and is available for free on my website at www.spike-a.com/astrogadgets, but it does require some computer knowledge in order to set up the alert properly. In order to view the northern lights, it’s best to be well away from any outdoor lights and have a clear view of the northern horizon. You should plan on spending at least 30 minutes in the dark to allow your eyes to become fully dark adapted. This entry was posted in Family, Outdoors and tagged Astronomy, Aurora Alert System, Aurora Borealis, David Oesper, Iowa County Astronomers, John Wunderlin, Northern Lights. Bookmark the permalink.